Oil prices have crashed to below $27 a gallon -- a level not seen since 2003 -- which makes a barrel of crude cheaper than lots of everyday purchases that we don't think twice about. 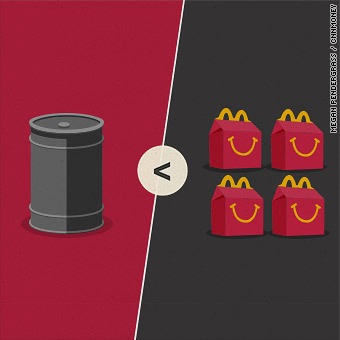 You can get a barrel of oil for less than what you'll pay for four four value meals and four desserts. But you won't get fries with that.